Report on the 8th Round NSWRL VB NSW Cup match between Newtown and the New Zealand Warriors, played at Henson Park on Saturday, 26th April 2014 at 3.00pm. The boys from across the Ditch handed out a 48-12 hiding to the Newtown Jets at Henson Park on Saturday. 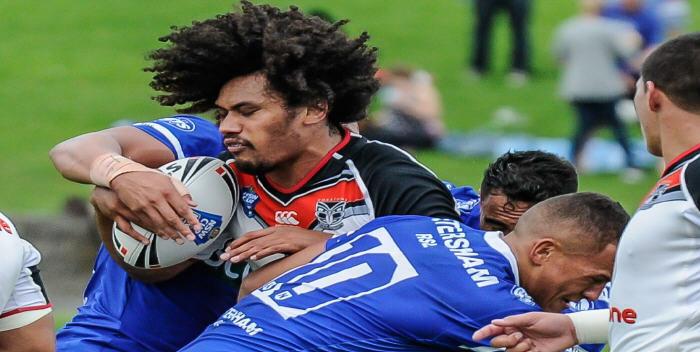 The New Zealand Warriors took a 16-0 lead in as many minutes in this 8th round NSW Cup fixture, and had the game in their keeping when they led 28-6 at half-time. The Warriors had one player sent off and another sin-binned early in the second half, along with one Newtown player being dispatched for ten minutes. The Warriors still managed to add a further twelve points during the period that they were down to eleven men. The New Zealanders recorded high completion rates in both halves, defended resolutely and were more disciplined than their opponents. The Jets turned over too much possession in the first half and rarely challenged the Warriors at their end of the field. Newtown’s sole try in the first half came in the 23rd minute when Arana Taumata grubber-kicked in behind the Warriors defence and fullback Shannon Gallant won the race to ground the ball. Gallant earned the further admiration of the crowd when he ran down Warriors speedsters on two separate occasions when both looked certain to score. Jets coach Greg Matterson was understandably less than pleased with his team’s first half performance. He demanded of his players that they be more committed in defence and to show more discipline and pride in their game. Unruly scenes ensued behind the Warriors northern end try-line in the 47th minute. Gigantic Warriors forward Sam Lousi was sent from the field for striking an opponent while his equally imposing brother Sione was sin-binned, along with the feisty Shannon Gallant from the Jets. The Warriors added four more tries in the second half, including two runaway efforts from midfield. Jets prop and Fijian World Cup representative Kane Evans ripped through the Warriors defence in the 63rd minute to score Newtown’s only try in the second half. The Jets completion rate in both halves hovered around the fifty-five per cent mark and effectively kept Newtown out of the game and allowed the Warriors too much possession. Coach Matterson said after the match that his team was playing too much like a group of estranged individuals and that he would be working doubly hard on promoting a better team culture. Every player needed to make their own contributions to turning the season around. Front-rowers Rémi Casty and Kane Evans were two of Newtown’s best and second-rower Sio Siua Taukeiaho turned in a strong performance against his former Warriors team-mates. Jets five-eighth and Tongan international Samisoni Langi looked at his best when he took on the Warriors line. Fullback Shannon Gallant continues to win fans at Henson Park with his wholehearted approach to the game. The Jets are back again at Henson Park this Saturday, 3rd May, when they have a 3.00pm appointment with the Manly-Warringah Sea Eagles in Round 8B of the VB NSW Cup.